Crafting likable, interesting characters is a balancing act, and finding that perfect mix of strengths and weaknesses can be difficult. But the task has become easier thanks to The Negative Trait Thesaurus. Through its flaw-centric exploration of character arc, motivation, emotional wounds, and basic needs, writers will learn which flaws make the most sense for their heroes, villains, and other members of the story's cast. 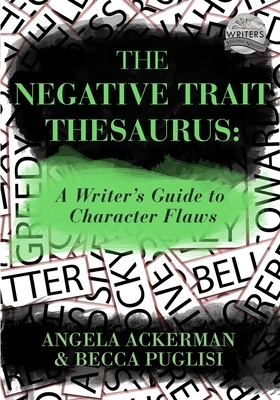 This book's vast collection of flaws will help writers to explore the possible causes, attitudes, behaviors, thoughts, and related emotions behind their characters' weaknesses so they can be written effectively and realistically. Common characterization pitfalls and methods to avoid them are also included, along with invaluable downloadable tools to aid in character creation. Written in list format and fully indexed, this brainstorming resource is perfect for creating deep, flawed characters that readers will relate to. Angela Ackerman and Becca Puglisi are bestselling authors, writing coaches, and international speakers. Their books are available in five languages, are sourced by US universities, and are used by novelists, screenwriters, editors, and psychologists around the world. Angela and Becca also co-founded their popular Writers Helping Writers site, a hub where authors can hone their craft, as well as One Stop for Writers, an innovative online library built to help writers elevate their storytelling.